NY Glam Squad is a company of makeup artists that are able to apply traditional makeup or airbrush looks based on the style you are trying to achieve and which one you prefer. With on-location wedding hair and makeup packages, you can be sure that you will look stunning and feel comfortable for your walk down the aisle. One of the best aspects of working with these Long Island makeup artists is that they can customize their packages to suit any size group or budget. Glamour Me Up Down The Aisle LLC. You do not need to go to such extreme lengths as to get permanent makeup done in order to make sure your bridal look will last. All you need to do is work with a company that is talented enough to achieve any style you request while also making sure that it lasts throughout the entire event. For very reasonable prices, you can hire the team at Glamour Me Up Down The Aisle, LLC to do just that, which is backed up by the countless positive reviews. 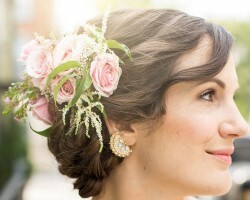 Bridal makeup can be affordable when you work with Love Your Face Beauty. Amanda is the owner and operator of this company. She has a passion for brides and thus works to make her services as flexible and as accessible as possible so more brides can experience her professional services. Whether you would like something simple or would simply like to have the peace of mind knowing that an expert will complete your look flawlessly, Amanda will be there at your wedding venue to get you ready. Looking and feeling your absolute best on the most important day of your life starts with finding a stellar makeup artist in Long Island, NY. This is why so many brides in the area choose to work with Chelsea Leigh Beauty. This company has the most talented team that are able to achieve your dream look or guide you towards a style that suits the event and the theme that you have chosen. This is a feature you will only get when working with such a professional service. If you would like to have your wedding makeup done by an expert, then you need to work with Jill Harth and her team. Together they have years of experience providing flawless looks to women getting married in New York City, Long Island, or the Hamptons. They can do just you or your entire bridal party, too. You can choose the application method and the colors that you love or let the experts provide you with the best look for your features and complexion. No matter what you decide you can be sure you will look amazing.